I can’t really see a reason for tourists to come to Kuala Lumpur. The World Heritage sites of Melaka and Penang – of course. The Highlands, for cooler weather and lots of nature, certainly. Islands and beaches, unavoidably. But KL – very avoidable, especially given recent (and continuing) improvements to Malaysia’s transport infrastructure. There are fast rail links from the airport to the huge modern BTS bus terminal (Bandar Tasik Selatan) and the Sentral railway station, all south of the city centre, and there’s really very little point staying overnight. The main railway that runs the length of peninsular Malaysia has been electrified and rebuilt (although the southernmost part from Gemas to Johore Bahru won’t be finished until 2020) so you can get from one end of the country to the other in a day. The National Museum is almost next to Sentral and apart from that, there’s the rather dull colonial centre, and the Petronas Towers, which are very high but apart from that not very interesting. Meanwhile the modern city centre is as choked with traffic, and as unfriendly to pedestrians and cyclists, as anywhere I’ve been recently. If KL is trying to match Singapore, it’s doing it the ugly way. Even the new business districts (towards the Petronas Towers, and including the entertainment and backpacker area of Bukit Bintang) are not built to any kind of a grid plan, so the monorail and MRT lines have been threaded through above ground, below ground and with some difficulty. On the plus side, the National Museum is good. Built in 1963 on the site of the Selangor Museum, partly destroyed by US bombing in 1945, it has four large galleries – start on the ground floor with pre- and protohistory and the Malay Kingdoms, then go up to the Colonial Era and a weaker display on Malaysia Today. Fine metal-working was established in this area up to 3,000 years ago, with bronze bells and drums from Vietnam and Cambodia, and there’s been trade with India for 2,000 years – Malay kingdoms were established in present-day Cambodia, Vietnam, Java and Sumatra between the second and fifth centuries, and from the fourth or fifth century there was a Malay kingdom in the Bukong Valley, north of Penang, where there are the remains of 60 or more Hindu stupas. Eventually there was a full patchwork of Malay Sultanates, some of which ‘accepted’ Residents from the British East India Company (along the lines of the earlier British Raj in India) and some of which (the ones with less tin) didn’t. Apart from the Straits Settlements (Penang, Melaka and Singapore – see my posts here and here) there was no unified British rule until 1946 (after the Japanese had invaded and eventually been thrown out) – and then it moved fairly rapidly to independence anyway (see here). However British forces (mainly Gurkhas, in fact) did have to stay on to fight Chinese communists in the jungle from 1948 to 1960 and to face down Indonesia until 1967 in the Confrontation, caused by Indonesian fears of neo-colonialism. 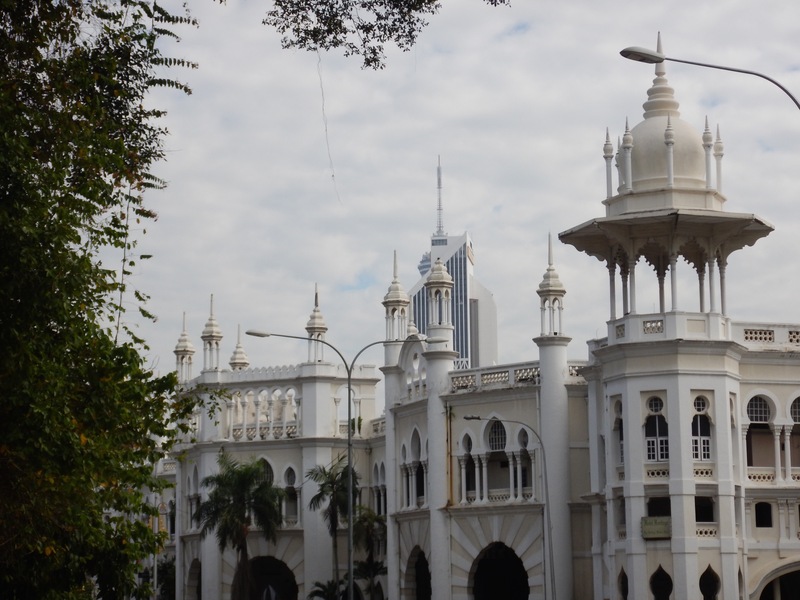 The more familiar part of the colonial district lies to the west of the river which gave the city its name (meaning Muddy Confluence) – Merdeka Square (the Padang or Parade Ground, later used as a cricket field) is surrounded by various imposing piles, many in a distinctive NeoMughal or IndoSaracenic style, such as the Royal Selangor Club (1884), the Government Printing House (1898, now the City Gallery and tourist information office), the old Post Office (1896), the Sultan Abdul Samad building (government offices, built in 1897), the similar Panggung Bandaraya DBKL (1896-1904, built as the city hall and now a hall for musical theatre), the National Music Museum (built as the Chartered Bank in 1888 and closed for refurbishment in January 2017), and the National Textile Museum (built as headquarters of the Federated Malay States Railways in 1905). To the east of the Klang river is an unexpected area of Art Deco buildings around the central market (itself built in 1928, although the area was laid out in the 1870s and 1880s) – there’s a plan to revive this area with a promenade and cycleway along the river (along the lines of what has been achieved in Seoul), which might be wonderful if properly done, but what I’ve seen of the cycle route so far has been disastrously bad. As things stand one might want to gently cycle around the Padang, but that’s about it for pleasant cycling in KL. Nevertheless, if there were budget accommodation in this area, I might begin to think of it as an attractive area in which to spend a night or more. The new ETS train service (supposedly the only 160km/h trains running on metre-gauge track in the world, although it didn’t go above 140km/h when I went from KL to Butterworth) is quite impressive, with free snacks but no wi-if on trains or stations. It’s well used – be sure to book in advance. 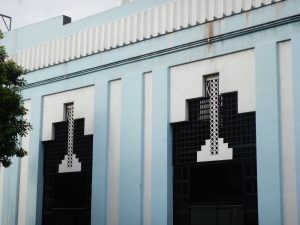 It’s much easier to buy tickets at the classic station (built in 1910), immediately north of Sentral – your ticket will be from Sentral but trains stop at both and you can board at either. The introduction of the ETS service (apart from the southernmost end – see above) has meant the abolition of the overnight services, which as everywhere in the world at the moment struggled to pay their way. In the longer term there are plans for a Chinese-funded and -built high-speed line (more like a bullet train on totally segregated tracks) from KL to Singapore – this will terminate in Jurong, in Singapore’s western suburbs, even though the original rail corridor to the Keppel station is still available. Sentral is, like most modern rail interchanges, more of a shopping mall than a station (it’s a long walk to the Monorail stop). The Sentral MRT station is currently under construction between the station and the National Museum, so access to the museum is currently from the rear (past some preserved steam locomotives, as it happens). I was not impressed by the machines for MRT and monorail tickets – one stole my coins, another rejected my notes. Eventually you get a plastic token, cleverly encoded with the length of your journey, that will work the automatic gates (as in Taipei too). In January 2017 RapidKL introduced a cheaper cashless fare. but that’s with MyRapid and TnG (TouchAndGo) cards rather than cashless bank cards.